Summary: A new study reports long distance neural connections can target pools of stem cells in their niche and stimulate them to produce subtypes of olfactory bulb neurons. Source: University of Basel . Stem cells persist in the adult mammalian brain and generate new neurons throughout life. A research group at the Biozentrum of the University of Basel reports in the current issue of “Science” that long-distance brain connections can target discrete pools of stem cells in their niche and stimulate them to divide and produce specific subtypes of olfactory bulb neurons. This allows the “on-demand” generation of particular types of neurons in the adult brain. Our brain generates new neurons throughout life. A diversity of stimuli promotes stem cells in their niche to form neurons that migrate to their place of action. In an animal model Prof. Fiona Doetsch’s team at the Biozentrum of the University of Basel has now been able to show that feeding-related neurons in the hypothalamus, a brain control center for many physiological functions, stimulate a distinct type of stem cell to proliferate and mature into specific nerve cells in response to feeding. Stem cells reside in only a few areas of the brain. The largest reservoir is the subventricular zone, where quiescent stem cells lie closely packed together. Signals from the environment can trigger stem cells to start dividing. 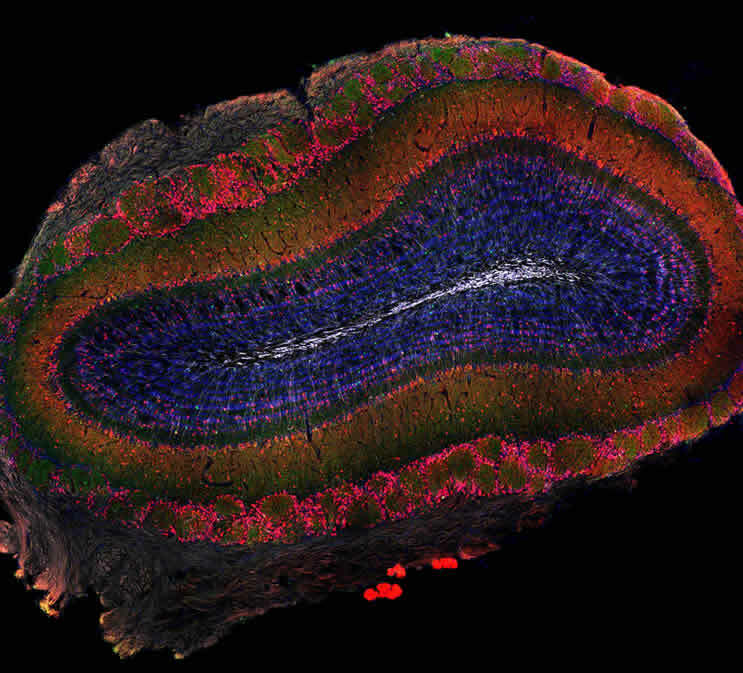 The stem cells in the subventricular zone supply the olfactory bulb with neurons. In rodents, almost 100,000 new neurons migrate from the stem cell niche to the olfactory bulb each day. Olfactory stimuli reaching the nose are processed in the olfactory bulb and the information is then sent to other brain regions. The closely interwoven network of diverse olfactory bulb neurons is important for distinguishing odors. Each stem cell has its own identity, depending on its location in the subventricular zone. While new neurons are continuously generated, whether niche signals act to control different pools of stem cells is unknown. “We have uncovered a novel long-distance and regionalized connection in the brain between the hypothalamus and the subventricular zone, and show that physiological states such as hunger and satiety can regulate the recruitment of specific pools of stem cells and in turn the formation of certain neuron subtypes in the olfactory bulb,” explains Doetsch. When the animals fasted, the activity of the nerve cells in the hypothalamus decreased and with it also the rate of proliferation in the targeted stem cell population. This returns to normal levels when the animals feed again. The division of stem cells can be controlled by changing the activity of feeding-related neurons. New neurons (white) enter the olfactory bulb, a part of the brain that processes odor signals. NeuroscienceNews.com image is credited to University of Basel, Biozentrum. Image Source: NeuroscienceNews.com image is credited to University of Basel, Biozentrum. University of Basel “Distant Brain Regions Selectively Recruit Stem Cells.” NeuroscienceNews. NeuroscienceNews, 16 June 2017. University of Basel “Distant Brain Regions Selectively Recruit Stem Cells.” http://neurosciencenews.com/stem-cells-brain-regions-6925/ (accessed June 16, 2017).